Journal Reference: Garrett T, I Glenn, and S Krueger. 2018. "Thermodynamic constraints on the size distributions of tropical clouds." Journal of Geophysical Research: Atmospheres, 123(16), 10.1029/2018JD028803. 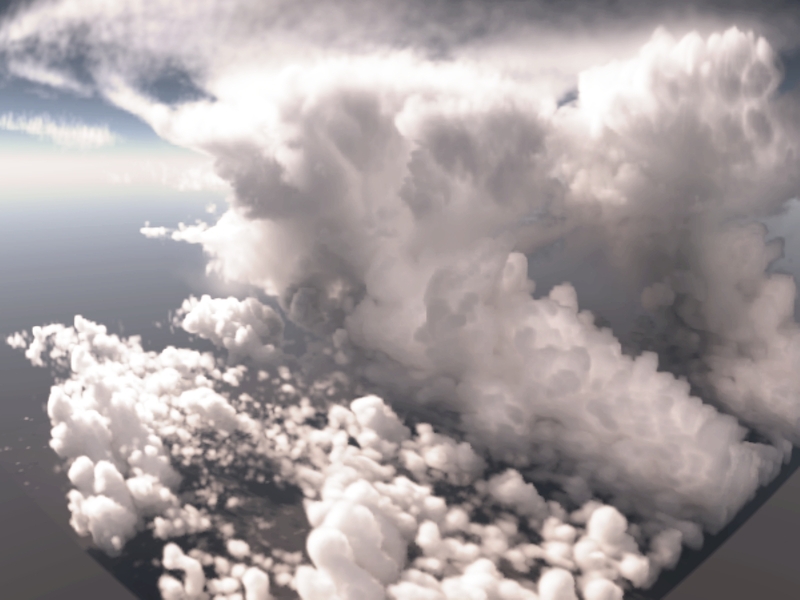 Numerical simulation of tropical clouds viewed after processing with a 3D radiative transfer solver. Statistics of tropical cloud properties from the Giga-LES simulation. a) saturated static energy h* versus height z b) perimeter λ versus height and c) saturated static energy versus perimeter. Note the simplified statistical relationships of exponential Boltzmann distributions across moist isentropes and power-laws along moist isentropes in the revised co-ordinate system. Narrowing uncertainty in forecasts of climate change has been hindered by the difficulty of representing the extraordinary complexity of clouds. We found that the numbers and sizes of clouds, and their total amount, can be derived thermodynamically knowing just the atmospheric temperature and humidity profile. 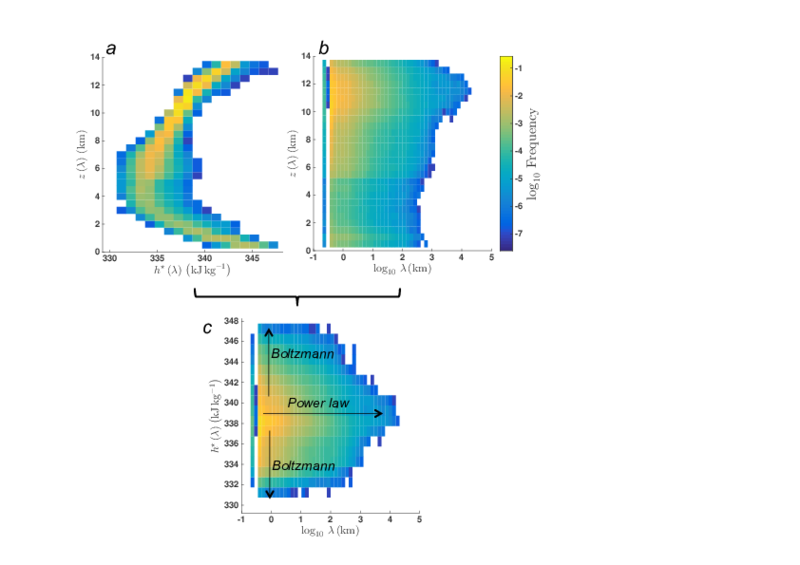 We showed that thermodynamically derived theoretical predictions for cloud amount and size distributions were closely reproduced within a detailed full‐day dynamic cloud simulation of one billion grid points. Thus, simple methods from statistical thermodynamics may provide constrained solutions for cloud complexity to complement much more detailed computational simulations. For the purpose of developing hypotheses about future climate states, we suggest that any tropical surface warming will lead to a slight increase in the total cloud cover but that there will be no change in how the clouds are distributed. In this case, the net impact of tropical clouds on surface temperatures may remain quite small. Tropical convective clouds evolve over a wide range of temporal and spatial scales, which makes them difficult to simulate numerically. We found that cloud statistical properties can be derived within a simplified time‐independent co‐ordinate system of cloud number n, saturated static energy h⋆, and cloud perimeter λ. Under the constraint that circulations around cloud edge compete with each other for total buoyant energy and air, we found that the product of cloud number and cloud perimeter nλ is invariant with λ and that cloud number follows a negative exponential with respect to cloud‐edge deviations of h⋆ with respect to the mean. Overall, the summed perimeter of all clouds scales as the square root of the atmospheric static stability. These theoretical results suggest that the complexity of cloud field structures can be viewed statistically as an emergent property of atmospheric bulk thermodynamics. Comparison with a detailed tropical cloud field simulation shows general agreement to within ≤13%.